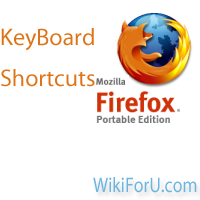 Recently I Have Written an Article on Keyboard Shortcuts For Google Chrome And Due to Requests from some Readers Now i am Going to tell you Some Useful Keyboard Shortcuts for Mozilla Firefox. 19. Ctrl + S To Save a Web Page or Any Document. These are some Few Shortcuts that i know. Please Comment here If you any Other. This will helpful for other Readers. Thanks and Enjoy Wiki For You.